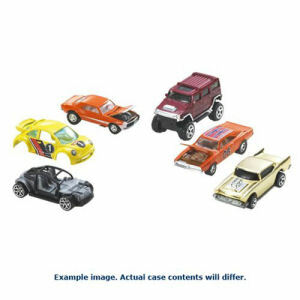 We have Just Sold out of Hot Wheels Basic Car 2017 Wave 12 Case. Not to Worry! Fill in the Notify me When Available and you will be the first in line for our restock of Hot Wheels Basic Car 2017 Wave 12 Case !! From the Hot Wheels collection by Mattel. Hot Wheels Basic Car 2017 Wave 12 Case. Case conatins 72 vehicles. There are a wide variety of vehicles in the assortment ranging from sleek sports cars to exotic racecars and popular roadsters. 1/64th Scale. Since their debut in 1968 Hot Wheels vehicles have been car enthusiasts and racing fans favorite. Mattel Hot Wheels Die Cast shipping from Canada. No Surprise Border fees or Customs!